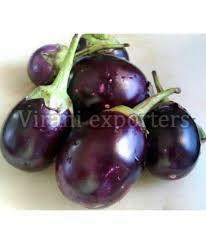 The Fresh Brinjal, supplied by us, is organically cultivated and is considered as a great source of Vitamin K, Thiamin, Vitamin B6, etc. We own a well-structured warehouse where the entire lot is carefully stored before making the final dispatch. The unit helps in providing protection from moisture, dust, rain, sunlight and more. With the aid of diligent professionals and smart packaging system, we can easily render bulk and customized packaging requirements of the patrons. Also, we ensure that the packed lot has shock sustainability to circumvent loss during transit.